I only use and share products that I genuinely love. The product supply lists that accompany my projects are simply intended to provide a visual overview of what I've used in case you have the same items at home or would like to add them to your own shopping list. I link to several stores in the UK and US. 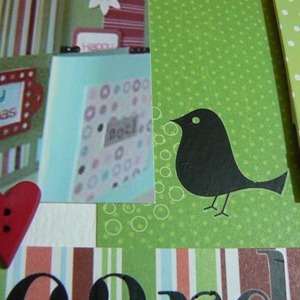 As of July 1, 2017 I am an affiliate member of Scrapbook.com and Amazon UK - this means that when you click on an affiliate link and go on to make a purchase I will receive a small percentage at no cost to you. Money raised through affiliate links will go straight towards my crafting fund. Finally, please note that any products marked "(r)" are retired and may no longer be available for sale online. 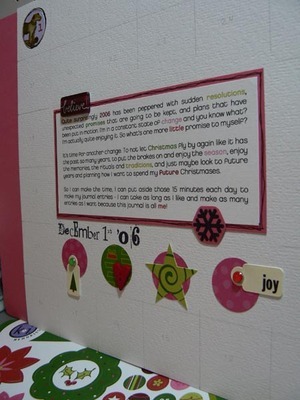 OK, so it might be over a month late... but I have finally finished my Christmas journal! And resolution #1 isn't doing so well either... but hey. Some nice fluffy Thickers to start the month, and since it's a tradition to watch the NY's Day concert from Vienna this had to be a wintry/snowy inspired page. The prompt for the second was all about childhood and innocence... well, I cracked open my white chocolate orange... and it made me realise that when we were little, our chocolate selection boxes never lasted into January! The 3rd was about looking back at Christmas and favourite memories from the season... well I had to get in one of the only family pics to come out ok (oh and a bit of that lovely real tree!). Got to love a bit of Love Elsie "Noel". The 4th was about reminders for next year. Well, I never got a chance to try the Baked Alaska recipe from Sainsbury's this year. I really wanted to try it as I have never ever had Baked Alaska, and well... it sounds very delish! Crate galore here, and my favourite set of foam Thickers - only have a few numbers left from that set. But I love the font! 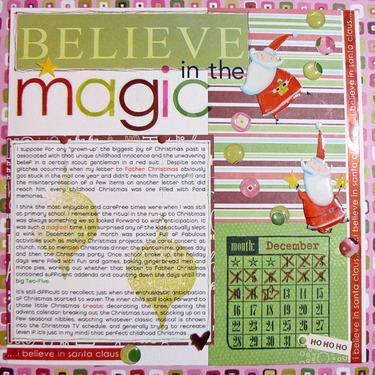 And the last day of Christmas... well, my Christmas journal is finished for this year, but the stash is ready to come out for Christmas 2011! I went to town a bit with Basic Grey's Eskimo Kisses stash! But what better reason to use it? 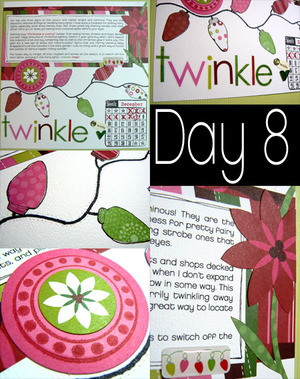 I had one page left to round off the journal... and used my yummy AC Moxie stickers and glitter MM stickers. So there it is, the whole journal finished. It has had to move out of the 2 Paperchase binders it was living in and is now held together with book rings and I made some acrylic covers... but I just wish my Paperchase binder could hold it all! 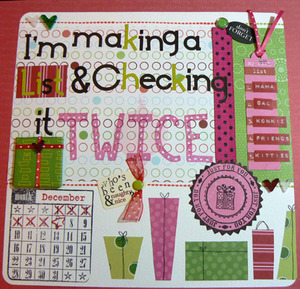 I know... it's mid-January and yet I am still plugging away with my journal! Better late than never though, eh? 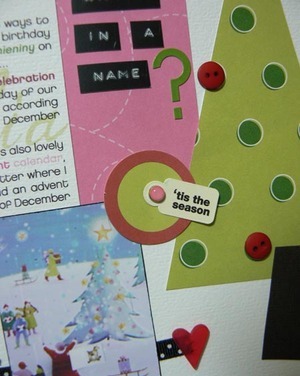 And a chance to use up loads of those KI Festive party/boozy embellishments! Oh and Stickles galore of course - hence the reason this was still drying last night! Right, I am off to plonk myself in front of the telly and catch up with some of my recorded shows. Here I am back with some more pages I made yesterday. So sad the Christmas break is almost over... and it's back to work tomorrow - the time has certainly flown by! 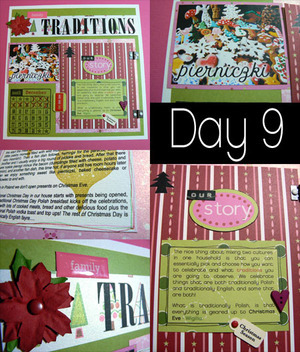 A happy coincidence that the little plate in the photo matched the background I'd already made for this page - phew! 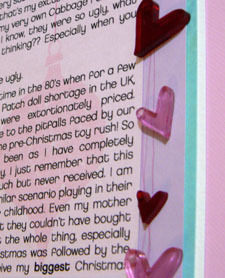 I just had to wheel out the glittery MM letters for this page! I managed to quickly snap a photo between one meal and time on the Wii! My dad joined in and the "rules" got rewritten and more complicated, however it was most entertaining and I think 2011 will see some more Monopoly matches, we certainly have enough sets to play with - next up the Polish version! But I could have done with a nice festive Starbucks! They are truly yummy books and far too tempting! They were regular Vanilla cupcakes in the end and went down very well. Well, I've had a nice rest over the Christmas break and haven't done much else other than enjoy some family time, catch up on my reading, eat, drink and be merry, suffer the return of the Monopoly wars chez the homestead, have a lovely Boxing day spent with family friends (followed by an acute need to purchase Samba de Amigo for the Wii asap), get to grips with my lovely new food processor/mixer, leaf through a stack of new baking books I received for Christmas, dash out to buy Just Dance 2 for the Wii (excellent purchase - much better than the first one!) 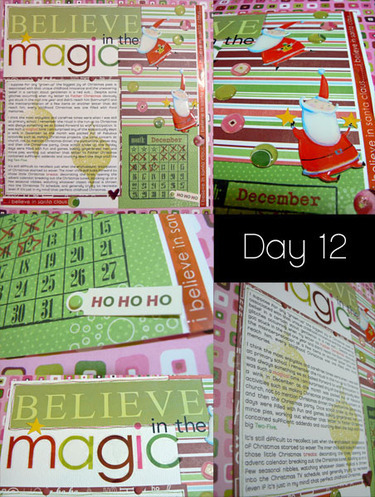 and... catch up with my Christmas journal a bit. So on that note, here are the entries I've caught up on. The new addition to my festive playlist this year was Pink Martini's new album - Joy to the World. Excellent tracks for all sorts of moods. 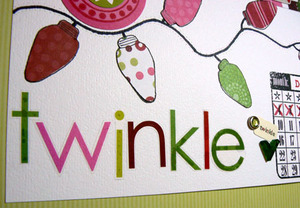 Lots of KI Good Tidings on this page. I made the gift bow from scraps of Jolly by Golly. This entry regarding visitors is an homage to the "annual" tradition of driving up to Zoe's to build the gingerbread house with the girls. Well, this tradition has only taken place once so far, the last two years snow has hampered the event... Maybe we'll have more luck next year! October Afternoon had some perfect Gingerbread themed items for this entry... and looking at that photo I now feel a bit peckish - think I'll have to go unearth my stash of Lebküchen! The entry for the 16th was all about being thankful... well I was just happy to have a few evenings where I could relax in front of the telly with just the fairy lights on and a peppermint candy cane to munch on. Jolly by Golly strikes again for this entry. So onto the 17th, and the theme for this prompt was the perfect gift. On my wishlist this year as a compact yet versatile food processor that could be mainly used as a food mixer but also had a blender. Well lo and behold one was found - a nice Bosch model that even had a stainless steel bowl and wasn't overly expensive. It went straight to the top of my letter to Santa! Crate Snow Days on this page in abundance. Basic Grey on this page, went great with that little plate from John Lewis - shame they don't still sell them as I'd love a set. The 19th was all about letters to Santa, well.... technically I don't write letters to him any more as I think he generally knows what I'd like what with the hints I drop.... but that doesn't mean Santa doesn't deserve his Mince pie... or cupcake for that matter! Lots of Jolly by Golly on this page plus some KI stickers. The 20th was about unexpected surprises... and yes, the unexpected surprise was that due to the snow some gifts had not yet materialised. In fact one gift still has not turned up and I've had no response from the seller... but that meant I had to write a few IOU notes to make up for the lack of present! On the 21st I went with the to-do list prompt as the colours of my photo were a better fit for the background... so here was my list! American Crafts with a hint of Basic Grey for good measure. On the 22nd I used a photo of "right now" - another relaxing evening with the fire on, my festive candles lit, and the tree and lights providing the only illumination. Quite lovely. Echo Park and glittery KI alpha stickers, plus some Crate chipboard. The 23rd was all about Stockings. Well, I don't actually have a stocking, but I do purchase the odd stocking filler, and the obvious choice is the good old chocolate orange. So that's it so far, I have photos printed through to New Year's Eve so will work on those entries tomorrow - off to the homestead this afternoon for dinner, and no doubt more Monopoly - probably the Polish set this time! It's been a funny old day. I woke up very early so started reading a new book, then didn't get up until I'd finished it. After that I went out to try and clear more ice off the street. We currently have excellent conditions for speed skating down the street - 3 to 4 solid inches of ice. And I mean solid! I managed to clear a bit more from the pavement and area around my car but heaven knows how it will be in the morning and if I will get out OK for work. Fingers crossed as I really need to get into the office this week. 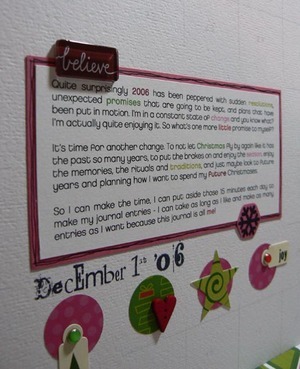 And when it started raining I came in to get on with my Christmas journal. Progress would have been much better had I not been watching Glorious 39 at the same time, I ended up abandoning my stash pile and just watching the film. Despite my reservations about whether it would be for me or not, it was actually really good (a bit gruesome at times) but much better than I'd imagined. 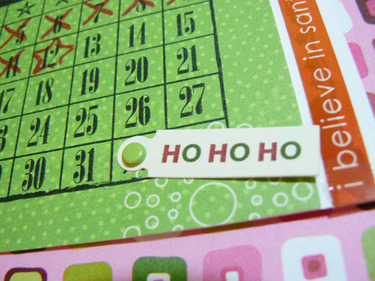 So back to the festive spirit and some journal entries to bring me up-to-date. 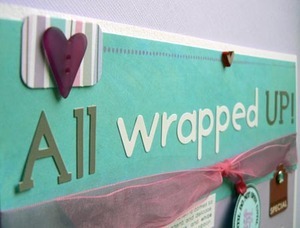 The entry for the 10th is all about this year's gift wrapping plans. Well, I have the paper (kraft and a nice white pattern from Ikea) at the ready, just need the gifts to wrap! A mix of Crate and Echo Park on this page. I can never get a full length shot of my tree that doesn't make it look ugly. It's silver, very shiny, and fibre optic - it sounds dreadful when you try to describe it, but it's very pretty in real life, and looks lovely lit up. However I had the joy of decorating a real tree at my mum and dad's last night - and it is very gorgeous - just needs more lights! 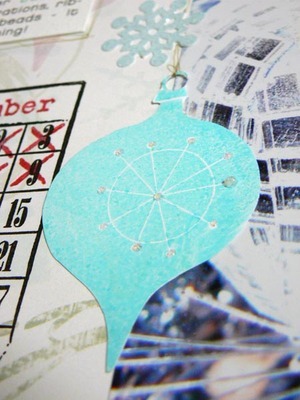 And for this page, I took a photo of my oldest ornament on my tree. It's a little knitted angel I remember my mum buying us (I got the angel and my brother got a felt panda - go figure!) at a Christmas fayre at one of the local primary schools when I was little. She's been on the tree ever since and now has since moved to my own tree. She's looking pretty good for a twenty-something. A bit difficult to photograph without glarey reflections of me trying to snap the photo... but I think it has turned out quite nice considering. 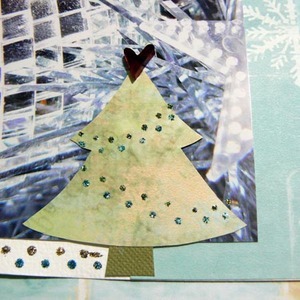 It's a bit difficult to see in the pic that the background under the overlay for the houses is frosty glittery cardstock - I also used some co-ordinating Eskimo Kisses dimensional stickers and a KI glittery snowflake. All in all, I'm rather happy with how this one turned out. :o) But my little Paperchase binder is getting rather full - and it's only the 9th! Something tells me that by the end of this album there will be some giant book rings making an appearance to hold it all together. Here's my entry for today's prompt - all about the sights of the season. When I was in town on Saturday I took a few snaps of the shop displays, including this one at the florist's - complete with baskets of decorations, lovely looking wreaths and bulbs planted ready to give away as gifts... very rustic and charming - and out of my price range! But pretty to look at nonetheless. Some vintage KI Festive on this page with a dash of Cosmo Cricket. Just playing catch up with yesterday's prompt. All about to-do lists. And my current non-work-related to-do list has essentially one item on it. Before the snow hit, I hadn't made much progress - couldn't find just the right thing in the shops... but was hoping come December I'd have everything sorted. Also, just a reminder for this week's DCM dare - there is a very bling-y prize up for grabs! So today's prompt was all about a tale of two Christmases. And for me, every Christmas is a tale of two Christmases as we celebrate both Polish and British traditions. And boy do we celebrate Christmas morning over breakfast... anyway... on with the pics! This photo of my wintry Matryoshka collection sums it up best - East meets West in Matryoshka form! What are the odds? 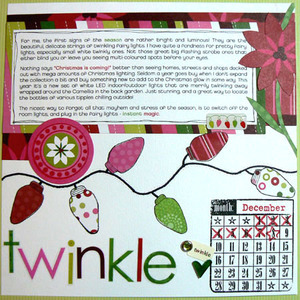 I'm up-to-date with my Christmas Journal - here's the entry for the 5th - the countdown to Christmas! A photo of my lovely new M&S advent calendar chalk board.... Shame about the glare from the window onto the page but I couldn't get a better pic. Lots of Basic Grey Jovial in this one, plus some machine stitching on the photo mat. And I love that robin brad! 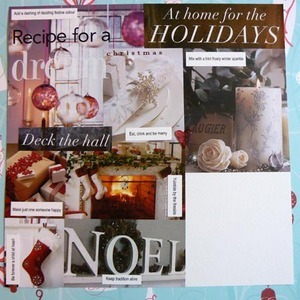 December 4th's entry, and it's all about Christmas dreams. BUT I would be very happy indeed if the snow melted for a bit, and we then had a white Christmas! 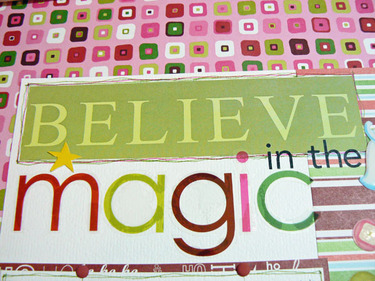 As many visitors to this blog will know, cards are what I do. And the prompt for the 3rd was right up my street. I took a pic of where my handmade Christmas cards have been living these past few months while I've continued to add to the stockpile. Let's just hope I've made enough to go round, as the next task will be writing them and sending them! 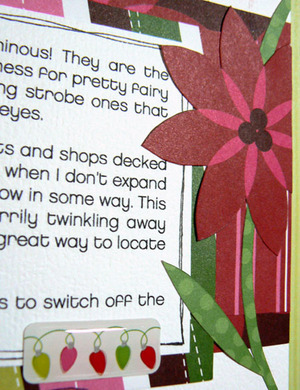 And it is always fun trying to match a card to the recipient (and in some cases their stash tastes!). Decisions, decisions... Anyway, time for some vintage stash on this page. 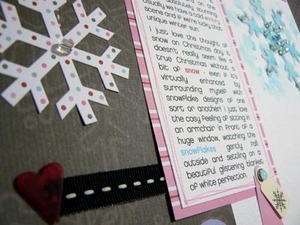 My most favourite ever glazed snowflake paper from American Crafts and lots of Love Elsie accents. 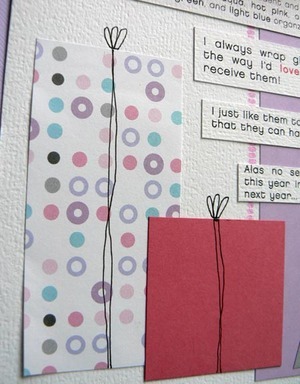 Plus a couple of dew drops from The Ribbon Girl. December 2nd, and the prompt was all about the weather... well, there has been little else in the news of late as the entire country has now had a brush with snow. We've had heavy snow since around the 25th and it's still here. So I had plenty of snaps to choose from! There's something very seasonal about a post box covered in snow... And I just had to add in some snowmen, as I've not had chance to make any myself! The stash is all Echo Park plus a couple of Crate stickers, and of course a Thickers number. I've foregone the Manifesto entry for this year's journal as I've not got much journaling space with the album format I've chosen and my 6x4 snaps... just enough for the odd journaling strip. So my page is a pic of my love desktop calendar and it has reminded me that I seriously need to sort out a desktop calendar for 2011! Etsy here I come! And this year I am determined to finish it in album form! With that in mind I've made my album in advance just ready to add photos and tart up with some embellishments. 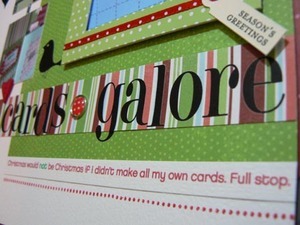 Who knew this would turn into a search for the perfect sized "Christmas" word in my stash... I always get stuck with left-over words on sticker sheets that I hadn't realised I had at the time I NEEDED them so they never get used up. This time I am determined to use up as many of those random word stickers as I can! OK, so Christmas isn't all that random a word for this project, but there are some interesting ones that will need to be incorporated some how. 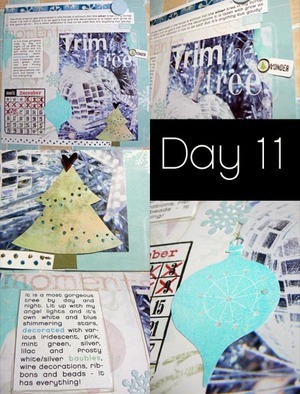 So I dusted off my prompts from Shimelle, and got to work on the Day 12 prompt. Oh and yes, I know it's only October, but judging by last year's pace, I need all the help I can get with a head start! Only a smidge of KI on this one! Namely those alpha transparency sheets and the "I believe in Santa Claus..." strip is also from that release. Can't believe these were the only Father Christmas images I had in the stockpile, but the challenge was also to use something really old in the stash, so I dusted them off (aaaaah David Walker stuff - love it) and the MM page pebbles are on bits of KI paper. I have so many of those to use up, that I think this journal will be a good home for them. 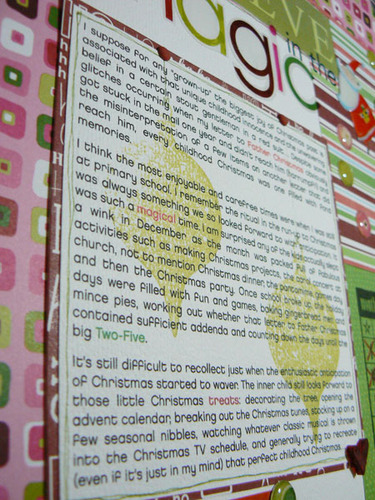 Remember the Christmas Journal I started back in December 2006?? You know the one where I was supposed to keep up with doing one entry a day... hm... well that didn't quite go according to schedule, so I am still working away at the journal (like today) but first I needed to get my cover page finished! Worked out quite well in the end - they were just the right size! 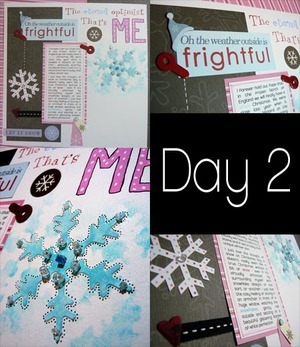 So here we are, a bit of a different look this time round as I have unearthed the remaining Winter papers from Rhonna Farrer that I just loved! Wish she had more papers like this out as they are great backgrounds, not detracting from photos. 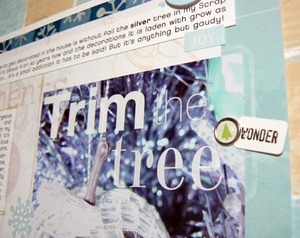 The first tree to get decorated in the house is without fail the silver tree in my Scrap Hovel. I've had it about 4 or so years now and the decorations it is laden with grow as the years go on… It's a small addiction it has to be said! But it’s anything but gaudy! It is a most gorgeous tree by day and night. Lit up with my angel lights and it's own white and blue shimmering stars, decorated with various iridescent, pink, mint green, silver, lilac and frosty white/silver baubles, wire decorations, ribbons and beads - It has everything! I had a bit of an accident with my stickles - for some reason they were sputtering out huge lumps of glitter rather than the usual soft look... oh bum... so a bit of AC ribbon came in quickly to hide the worst! 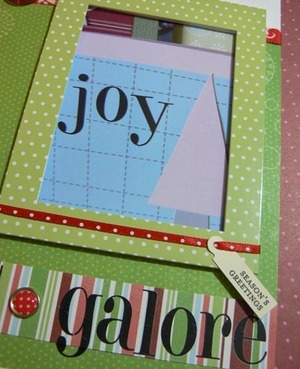 For once I had the perfect fonts in white in my rub-ons box - Heidi Swapp (some of the few letters that weren't mauled in the pack - shame as I love this font), American Crafts doo-dad from the white Jack UC set for "the" and American Crafts lulu font for "tree". Bit of bling and glam - there are dabs of glitter on the background baubles, but also the MM snowflake sticker is very bling! And here's an example of how to cover up a boo-boo! 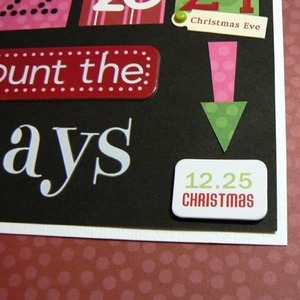 Stamping gone wrong, so just cover it up! So here we are back in Journal Land. Anyway as Shimelle said, day 10 was supposed to be quick - and it was rather! Tissue paper is just my favourite invention when it comes to Christmas wrapping. It just looks so decadent and delicate. 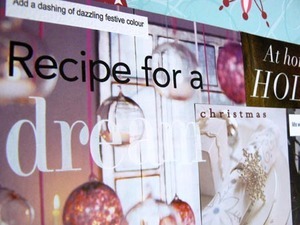 This year's colours are silver, aqua, hot pink, and white teamed with red, lime green, and light blue organza ribbon. I always wrap gifts the way I'd love to receive them. 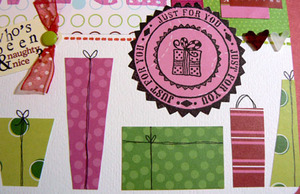 I just like them to look extra special for whoever receives them so that they can have the fun of unwrapping them! Looks a bit cold in the photos, but it's very bright in real life! The gifts in this year's colours! 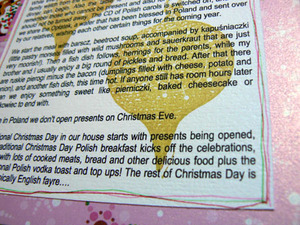 Since my tradition in this prompt is all about celebrating a Polish Christmas Eve... and boy was there a lot of journaling, so much so it's in a teeny font inside too! 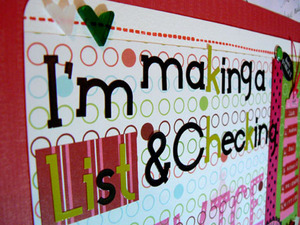 And the journaling - prepare for a long one! The nice thing about mixing two cultures in one household is that you can essentially pick and choose how you want to celebrate and what traditions you are going to observe. We celebrate things that are both traditionally Polish and traditionally English, and some that are both! 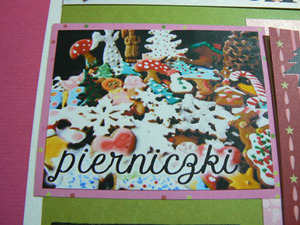 What is traditionally Polish is that everything is geared up to Christmas Eve - Wigilia. In the run-up we go out and search for traditional Polish foods, especially rye bread (yum! ), various herring dishes (not for me! ), Polish pickles, pierniczki (failing that other honey-spiced treats like German Pfeffernusse), makowiec (poppy seed cake) and the odd random item. A Polish Christmas Eve traditionally runs to 12 fish or vegetable-based dishes - but this is a bit too much for us to handle, plus it'd require about a week in the kitchen! So we limit ourselves to just a few dishes with something sweet to end on. There is no meat or alcohol to be consumed on Christmas Eve. Christmas Day is whole other matter entirely! While everything is being prepared on Christmas Eve, the children of the family watch from the window to spot the first star in the sky, as that's when dinner can begin. Also the table is laid with one extra place setting to remember those who cannot be present and also for a wandering guest who should not be turned away. The CD of Polish carols is switched on, and then we share the Opłatek, a wafer that has been blessed in Poland and sent over by our relatives, wishing each other certain things for the coming year. We start the meal with barscz, beetroot soup, accompanied by kapuśniaczki (little pastry morsels filled with wild mushrooms and sauerkraut that are just very moorish!). Then a fish dish follows, herrings for the parents, while my brother and I usually enjoy a big round of pickles and bread. After that there are ruskie pierogi minus the bacon (dumplings filled with cheese, potato and onion), and another fish dish, this time hot. If anyone still has room hours later then we enjoy something sweet like pierniczki, baked cheesecake or makowiec to end with. Unlike in Poland we don't open presents on Christmas Eve. The only ovals I love in the world are those KI ovals from their mod blox and tag sheets, etc. I am strange that way, but they are so delish! 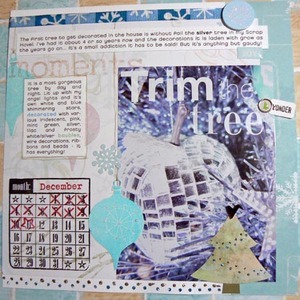 I love that frosty tree paper! So hurrah! 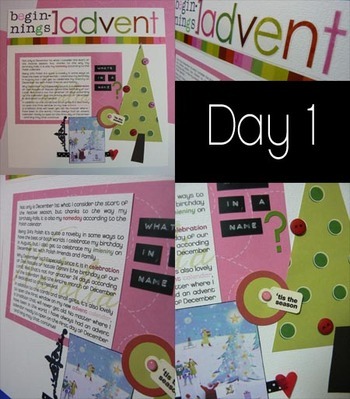 Here is an update to my Christmas Journal. OK, it's only one entry, but still! This is one entry more than I had last week! Another KI extravaganza, this time twinned with some free-hand light bulb bits and Hampton stamps. For me, the first signs of the season are rather bright and luminous! 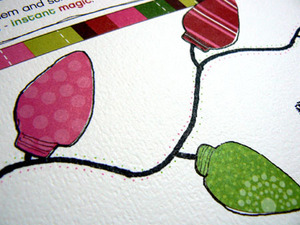 They are the beautiful, delicate strings of twinkling fairy lights. I have quite a fondness for pretty fairy lights, especially small white twinkly ones. Not those great big flashing strobe ones that either blind you or leave you seeing multi-coloured spots before your eyes. Nothing says "Christmas is coming!" better than seeing homes, streets and shops decked out with mega amounts of Christmas lighting. Seldom a year goes buy when I don't expand the collection a bit and buy something new to add to the Christmas glow in some way. This year it's a new set of white LED indoor/outdoor lights that are merrily twinkling away wrapped around the Camellia in the back garden. Just stunning, and a great way to locate the bottles of various tipples chilling outside! The nicest way to forget all that mayhem and stress of the season, is to switch off the room lights, and plug in the fairy lights - instant magic. Loving that I finally have a use for those KI acetate alphas! 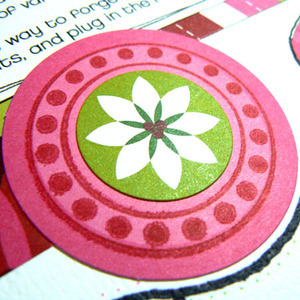 The hampton stamp on a KI diecut with a nice KI sticker in the middle. It's all about the fairy lights! 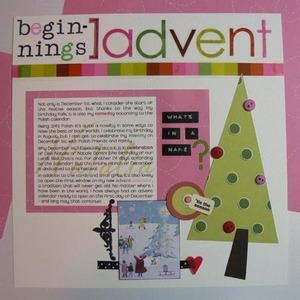 Well after lots of time spent buying some new Christmas tracks and previewing the vast, vast quantity of Christmas compilations, oh and after dinner of course, I sat down to check out the prompt for day 7. Total lack of journaling really as I was more in the playing mood. 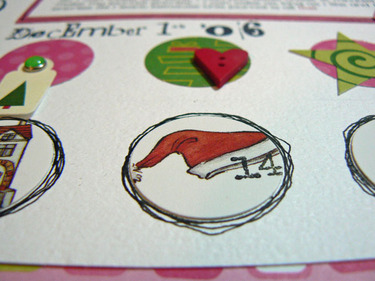 Not so sure about how this turned out, but look I finally got to use my date stamp on a page! Just need to go back and do the others now. 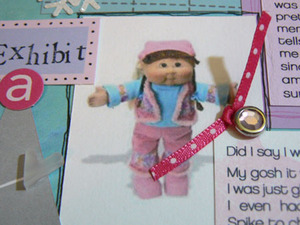 You see that Cabbage Patch doll? It's amazing how selective your memory can be when it comes to the Christmases of past. Especially when it comes to the gifts you dreamt 10 months in advance of seeing under the tree as a kid. Didn't we all covet the Argos and Kays catalog toy section months before the big day and start mentally penning our detailed letters to Santa? But it was the 80's, most things were ugly. I'm sad to report that this was the time in the 80's when for a few years running there were never enough Cabbage Patch dolls to go round in the UK, and those that were available were extortionately priced. Naturally, us children were never wise to the pitfalls faced by our wonderful parents when it came to the pre-Christmas toy rush! So bad my disappointment must have been as I have completely blocked the trauma from my memory. 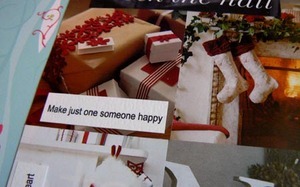 I just remember that this was the one gift that I wanted so much but never received. I am pretty sure that every adult has a similar scenario playing in their memory when they look back on their childhood. Even my mother tells me it was her biggest regret that they couldn't have bought me one, now I just pretty guilty about the whole thing, especially since the Cabbage Patch doll-less Christmas was followed by the amazing Christmas that saw me receive my biggest Christmas surprise as a kid. The My Little Pony Dream Castle! Did I say I was a child of the 80's? My gosh it was so unexpected that I was just glued to it for days after, I even had to take Majesty and Spike to church with me I was that over the moon. So it just goes to show, those disappointing Christmases can be overwritten and even erased - it just takes a little Christmas cheer and, OK, a whammy of a surprise for the ones that you love! I did the advent calendar topic in my day one entry, when I opened the first door, so I thought I'd go for just a bit of fun on this one playing with the KI and the slight lack of number stickers - who'd have thought it! 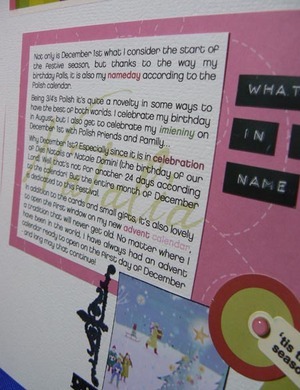 The page in full - no stamp yet - so counting down the days for that as well - Royal Mail permitting! 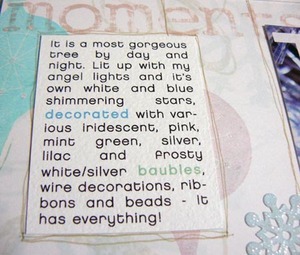 Also Tree has a lot to answer for, I have purchased a set of her circle stamps - I may even use them on a page - you just never know! Also after today's driving lesson (3-point turns - lovely!) my foot is a bit better from all that clutch action so have managed to walk on it. Yay! Off to watch the rest of Love Actually now as I try to clear up the mess! 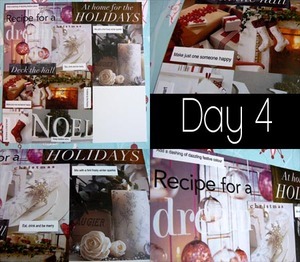 Day 4 - Vogue style! Right this has to be a quick update as I really need to go to bed! Bit of a departure from the other pages, but I wanted to do a kind of idea-board look to this one. I picked up a few magazines last week, even before starting this class just because they looked nice. Well I spent tonight cutting out and trimming and moving the scraps about and finally stuck them down. 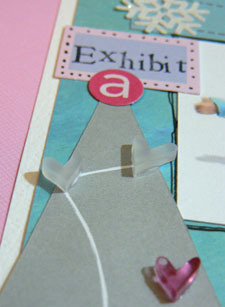 Bit difficult to photograph with the glossy scraps! But I rather like that Noel for the mantelpiece. And the lyrics to that song - just love them! The rub-ons! I also love those fuchsia baubles hanging from ribbon - hate to think what the ceiling looks like if you've not got a chandelier to hand! 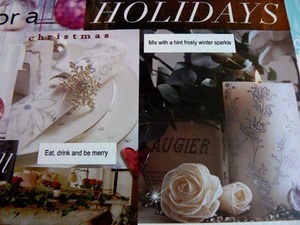 And the gorgeous candles from Laura Ashley and the place settings - don't you just love those snowflake napkin rings?? Hurrah the home stretch for the evening/day/weekend! Phew. 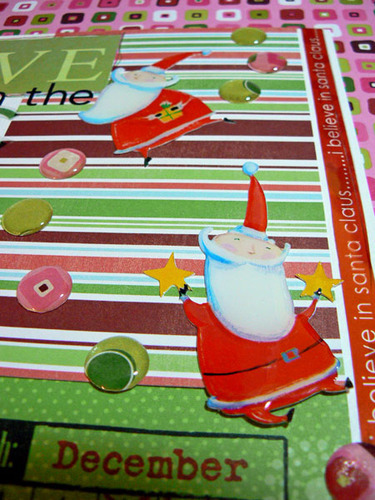 Basically journaling is short and sweet on this one: Christmas would not be Christmas if I didn't make all my own cards. Full stop. 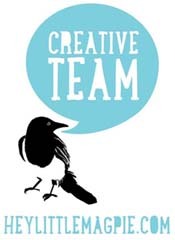 I'm rather fond of the simplicity of this entry - why is it tho, that simple things take me EVEN longer?! dither, dither.... It's just some of last year's Carolee's papers, MM frame, brads and tags, AC Frankie rub-ons and dings (aren't they fab those dings? 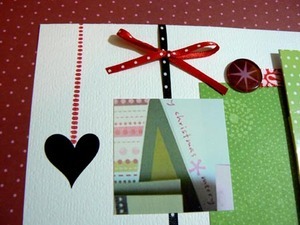 ), what seems to be the second to last doodlebug heart button, and some ribbon. The ribbon down the side is supposed to be a take on those ribbons you hang your cards from and I sincerely hope I have left enough space for that Cherry Arte stamp, it's going to be very tight! And the close-ups - ta-daaa! The Robin - I just love Rocky there! Heart - I :heart: that heart! How apt, as it has been pouring with rain and blowing a real gale all through the night - yes the weather outside is very frightful! Change of colour for my wintery look ;oP. A fair bit of KI, some Kopp rub-ons, Purple Onion and Elsie stamps, Embelleez beadz, they are my fave beads totally! But I need to get some thinner beading needles, the little MM tag and the Doodlebug heart button - think I'll be moving onto other signature buttons soon as these are dwindling now! "I forever hold out hope that in the frozen North of England we will finally have a white Christmas. We were close last year when it snowed a blizzard on the 27th - absolutely stunning. Usually we have a cold wintry scene and if we're lucky that unique winter sun. 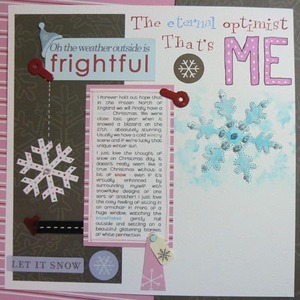 I just love the thought of snow on Christmas day, it doesn't really seem like a true Christmas without a bit of snow - even if it's virtually enhanced by surrounding myself with snowflake designs of one sort or another! I just love the cosy feeling of sitting in an armchair in front of a huge window, watching the snowflakes gently fall outside and settling on a beautiful glistening blanket of white perfection." And now for the close-ups! Just love that KI Alpine chipboard - cute little hat eh? Right, I'd best get on with day 3's page! So I did manage to sit down and start on my first proper page just to document yesterday since it's quite a special day in its own right. Once again lots of the old KI - it needs using up! "Not only is December 1st what I consider the start of the festive season, but thanks to the way my birthday falls, it is also my nameday according to the Polish calendar. Why December 1st? Especially since it is in celebration of Dies Natalis or Natale Domini (the birthday of our Lord). Well that's not for another 24 days according to the calendar! But the entire month of December is dedicated to this festival. In addition to the cards and small gifts, it's also lovely to open the first window on my new advent calendar - a tradition that will never get old. 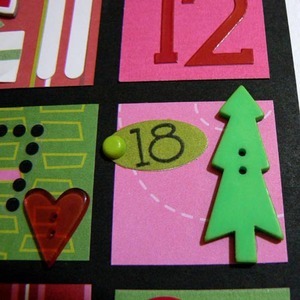 No matter where I have been in the world, I have always had an advent calendar ready to open on the first day of December - and long may that continue!" 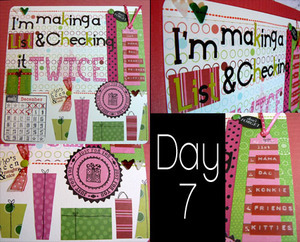 So here are a few close-ups - I am digging my close-ups... ignore the mucky attachment of the KI transparency letters hehe... oh and that blank space in the bottom corner is awaiting the Chery Arte calendar stamp - hope I've left enough space! 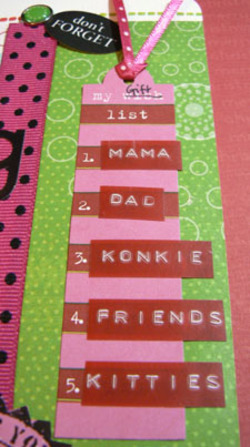 I am just loving those little Making Memories tags and the doodlebug buttons - I am definitely going to run out of those hearts soon! 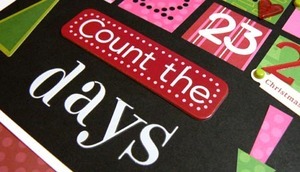 Oh and there's a piccy of the advent calendar, much nicer in real life. So no reading of any books tomorrow, and I must do entry 2 and 3 as you can see from the time, it ain't going to be tonight for entry 2! 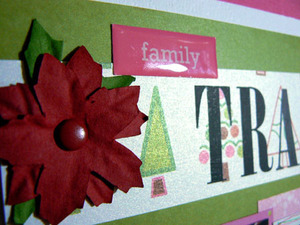 And my not a single Christmas card made - so baaaad! Yay, I did it! I have sat down and thought about what Shimelle gave us in the first prompt and thought, yep, keep it simple and organic and just see where it goes. Well I didn't finish the first entry. Really... I kid you not! Well it won't get truly finished until Christmas Eve! How neat is that?! 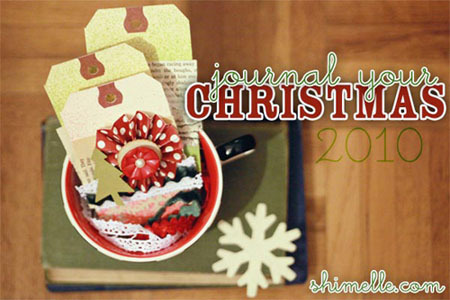 hehe That is truly a Christmas Journal in the making. 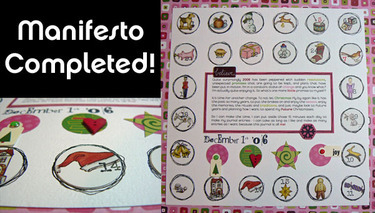 I've decided to use the images from my gorgeous advent calendar as details on the intro page (or manifesto if you will). So yes the pencil marks are still on there, since I'm not so good with lining up at the best of times and they won't get rubbed out until much later on! 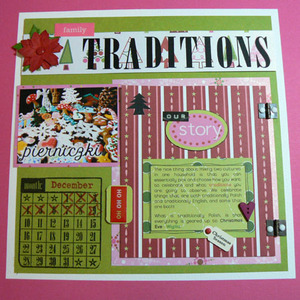 My 9x9 page has been split into 6 columns and rows so I can cut circles from the 24 images in the calendar. 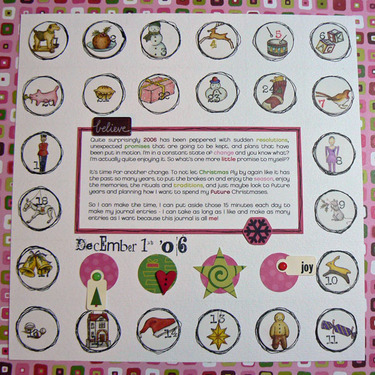 In the middle we have my journaling (sorry had to type it since I ran off a bit at the mouth) and a little decorative detail courtesy of MM, KI, Doodlebug plus Rhonna and Banana Frog stamps. Today's entry was a cute little doggy on wheels - how neat is that as I got one of those for either my first or second Christmas! "Quite surprisingly 2006 has been peppered with sudden resolutions, unexpected promises that are going to be kept, and plans that have been put in motion. I'm in a constant state of change and you know what? I'm actually quite enjoying it. So what's one more little promise to myself? It's time for another change. To not let Christmas fly by again like it has the past so many years, to put the brakes on and enjoy the season, enjoy the memories, the rituals and traditions, and just maybe look to future years and planning how I want to spend my future Christmases. So I can make the time, I can put aside those 15 minutes each day to make my journal entries - I can take as long as I like and make as many entries as I want because this journal is all me!" Anyway despite the fact the hovel looks like a bomb hit it, I'm all ready for more festive thoughts tomorrow! Dawn on DCM - Bingo! Sylv on DCM - Bingo! Svenja on DCM - Bingo! Angelnorth on DCM - Bingo!